You face difficult choices every day. Fortunately, they’re a lot easier to make when you have the right information. Choose the RICOH® MP 4055/MP 5055/MP 6055 to print, copy, scan and fax important notes, brochures, invoices, contracts and other documents quickly and economically. With the advanced 10.1″-wide Super VGA Smart Operation Panel, you can pinch, swipe and scroll like you do on your smartphone or tablet to check and adjust settings, automate tasks and distribute information with speed and precision. Select from multiple finishing options to add a professional touch to documents while eliminating outsourced printing costs. Set shortcuts to expedite everyday jobs. Print and distribute files while on the move using your personal mobile device. Help keep your best ideas safe with user authentication and other security capabilities. 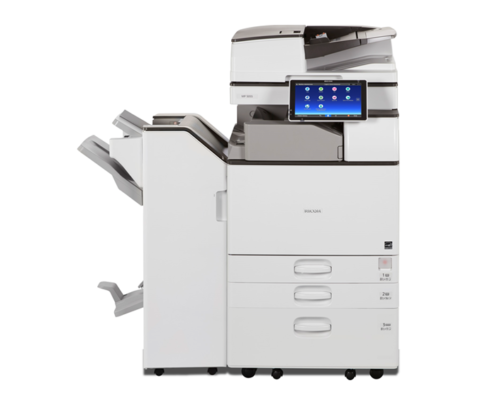 Plus, the versatile all-in-one MFP is designed specifically to use less energy, which helps reduce costs.